As winter drags on, you might be tempted to stay indoors and have a few beers to keep the chill out. Of course, we’re not the only animals searching for warmth and protection from the harsher weather, but we’re also not the only animals to appreciate a bit of beer. 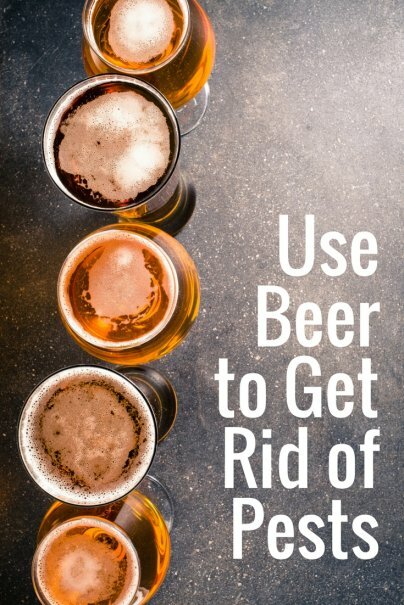 In fact, you can use cheap or leftover beer to trap many different bugs and pests. Cockroaches are among the most disturbing of household pests, but you can stop them with some things you probably have around the house already. Take a jam jar with a rounded inside lip. Coat the inner lip with Vaseline, then put a slice of beer-soaked bread at the bottom. The cockroaches will be attracted by the smell of beer, but the Vaseline-coated lip will make it impossible for them to escape. You can then dispose of them however you see fit. Another method to trap cockroaches involves less glass between you and the bugs. If you leave a rag that is soaking in beer out overnight, roaches will again be attracted to the beer and will probably throw the roach equivalent of a rave. But in the morning, they will still be drunk and won’t be able to scurry away when you come in to get rid of them. Fruit flies can also easily be trapped with a bit of beer. They are attracted to rotting and fermented food, essentially what alcoholic beverages are. So although this is an article about using beer to get rid of pests, you can use just about any alcoholic beverage to trap fruit flies. In this method, simply place a sheet of paper with a small hole in it over the top of an open can or bottle of beer. The fruit flies will fly in to feed on the beer, but will be unable to figure out how to get out of the opening. Then you can just get rid of the can of beer and the flies all at one time. Mice love a bit of beer, and you can create a humane trap by pouring some beer into the bottom of a bucket. Place a piece of wood or something similar to act as a ramp, so the mice can climb up the ramp to get at the beer. When they leap in to get the beer, they won’t be able to climb back out. You can then take the bucket (carefully, since you don’t want to traumatize them or hurt them) and release the mice outside. Once springtime comes around, you can still use beer to repel bugs and other creepy crawlies in your yard. Slugs, and to a lesser extent earwigs, can cause a lot of damage to plants and your lawn. Having a couple isn’t a problem, but if there are too many (or if you just hate that slime slugs leave everywhere), you can treat the problem without having to worry about putting out dangerous chemicals. There are many ways of trapping slugs and earwigs, but the principle is the same. Put a shallow dish with stale beer close to the ground (either dig a hole to put a can or jar lid in, or just pop it on the ground), so the slugs and earwigs can crawl in. They will then drown in the beer, and you can throw the whole thing out. You can also make your own insect repellent for your yard using beer, as well as a few other household products: Epsom salt, mouthwash (the kind that doesn’t kill germs), and dry yeast. Open a can of beer, and let it go flat. Pour the contents into a large spray bottle, then add half a package of dry yeast. Put on the lid of the spray bottle and shake vigorously to dissolve the yeast and the rest of the salt. Spray it on your grass and around plants to keep insects from crossing any perimeters. Repeat this every 20-30 days from spring to fall. The great thing about this insect repellent is that it is also a fertilizer: The magnesium in the salt and carbohydrates in the beer feed your plants, while the alcohol in the mouthwash repels insects. You should take care not to spray this on flowering plants, however, as it might kill them! If this works, I don't think it is the alcohol in the mouthwash that repels the insects. First you said to use the kind that doesn't kill germs, which is the type without alcohol. Secondly, even if there was alcohol, it would all evaporate in less than an hour and would certainly not be there for 20 days. In my garden I use crushed eggshells to keep slugs and snails away. It seems to work. Saying this was an interesting post would be an understatement! Who knew that beer could get ride of pest!?!? I'm going to try this out and see how it works. I would have never thought to use beer to help with pests. "Take a jam jar with a rounded inside lip" -- I cannot think what this means; any chance there might be a photo of what you're describing? Basically it's the inside of the top of the jar. One that has a groove inside of it!